Salt caves are built by experts of ZENDAR company and they are built to make an artistic impression and as well as to provide unique atmosphere. The main goal during a construction of a salt cave is to get the best quality necessary for the treatment of several illnesses. Salt caves walls are covered by salt stones from Pakistanian salt mine with weight of 10-12 tons. The ceiling is from plasterboard, covered by salt and formed in the stalactite shape. The floor is covered by different types of halit and salt water. Lennox airconditioning and Dospel ventilationg system is fixed inside a cave. This equipment provides suitable humidity, temperature and air circulation and therefore the microclimate is made which is the same as by the sea. 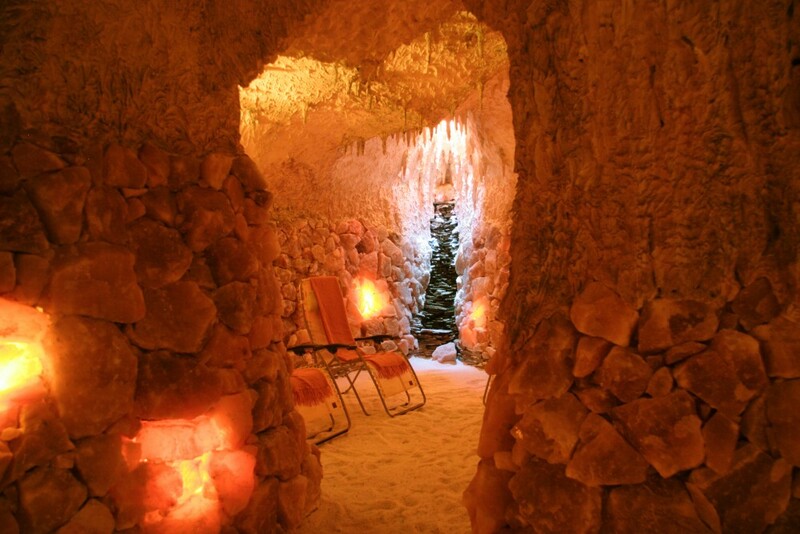 Each salt cave has air holes which are artistically covered by natural wood. The isolation door leads to a salt cave and they can be made to remind the atmosphere of an old mine door. The salt cave mood is supported by the lightning consisting of approximately ten dot-lit lamps. Each salt cave contains waterfalls from natural wood, water flows are supplied by pump of JEET 1500 type which distributes salt water from different curative salt types. If a costumer wishes so, we can also install ionizators, computer and alarm systems.